Nothing says comfort like cozying up to a big bowl of hearty stew on a chilly evening. 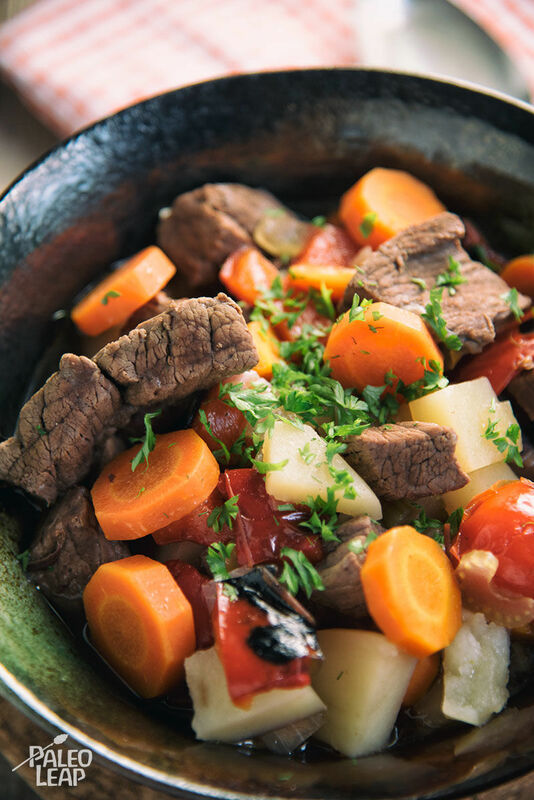 Filled with tender chuck beef and traditional chunky stew vegetables like potatoes, celery and carrots, this stew will leave you full and satisfied. And unlike other stew recipes that require multiple hours of tending and cooking, this stew requires under one hour of preparation and cook time. 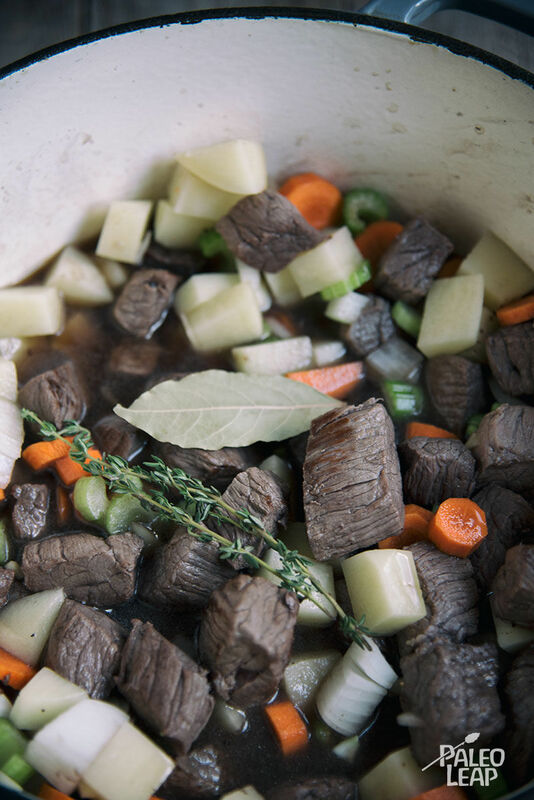 This stew calls for beef stock to be added. If you’ve been eating Paleo for a while, you’ve probably heard of, and maybe have even made your own bone broth. While you can find stock in most health food stores, homemade bone broth is nutritious and full of minerals and nutrients. The most time-efficient way to prepare broth is to make a big batch of stock with leftover bones, then freeze and save for later. Looking to add some color to the stew? Use rainbow carrots (yellow, red, purple) for a big boost of color! Keep dinner simple and just serve this satisfying stew on it’s own. Melt cooking fat in a saucepan over medium-high heat. Brown the meat on all sides, 1 to 2 minutes per side. Add the onion and garlic, and cook for another 2 to 3 minutes. Pour in the wine and deglaze the bottom of the pan. Add all the remaining ingredients except the roasted pepper, and bring to a boil. Lower heat, cover, and cook until everything is tender; 25 to 30 minutes. Add the bell pepper, season to taste, and cook for another 5 minutes.